We want to make it as easy as possible for you to get your surveys out. The less the friction, the more surveys you can send and the more feedback you can get. Everybody wins! One major bottleneck for a lot of people is getting their survey out via email. Until now, sending a survey to more than a few people required you to use a third-party newsletter service (MailChimp, Campaign Monitor, Constant Contact, etc.). You'd have to deal with importing user lists, designing a newsletter and worrying with dozens of other random settings just to send out a quick email. 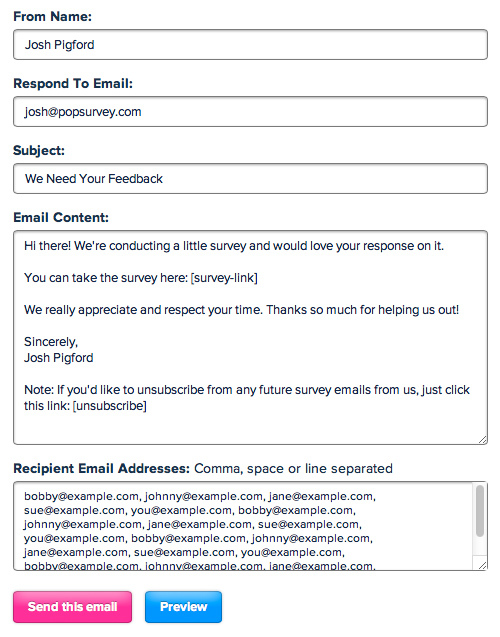 We've now made it ridiculously easy to send out emails with your survey using our new Email Invites feature! Under the Promote area of your survey, all you have to do is copy/paste your emails and then click "Send" and you'll be set! You can customize the email content if you'd like, but we do give you a full email to start with so don't even need to write that if you don't want to! We handle inserting the email link (which will automatically track the respondent's address when they respond) as well as the required Unsubscribe functionality to comply with various spam laws. Depending on your plan, you have a certain number of credits available and on the first of each month, they reset. For clarification, you certainly aren't required to use our Email Invites feature to email out your survey to your customers. You're free to use whatever you'd like. We're just adding an additional tool to make that process easier.